Well, yesterday was a momentous day! 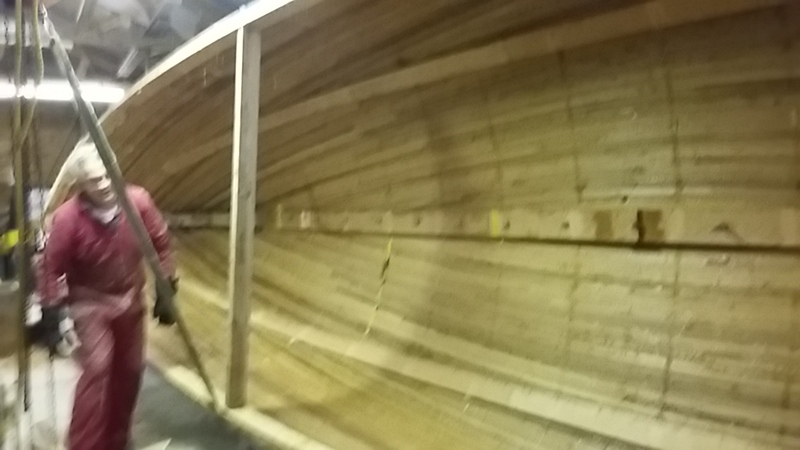 As noted in the previous post, I was totally ready to move on and stop filling/preparing the hull and see the inside! 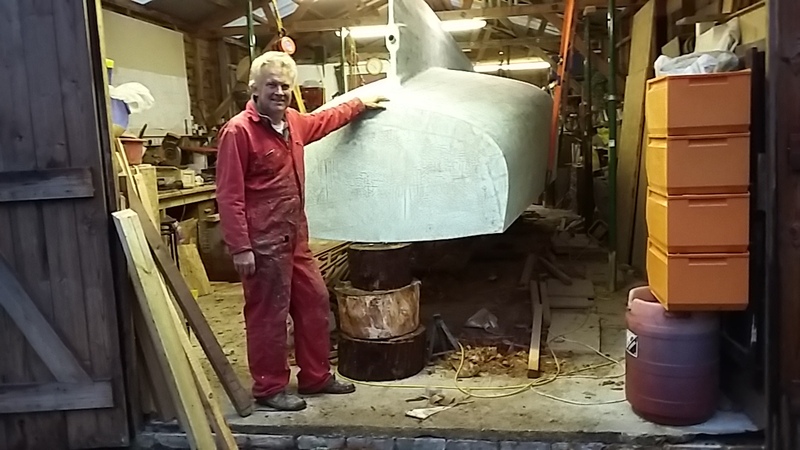 More assistance from Nigel Thomson from the SBA produced an excellent result. 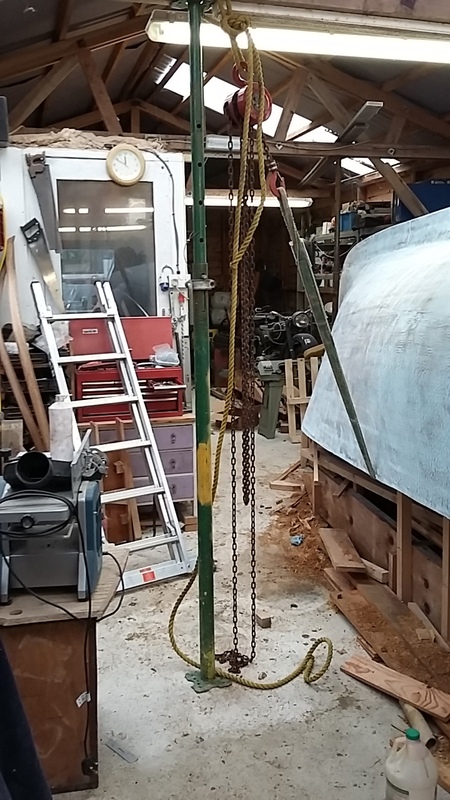 We propped the workshop roof with some Acroprops, fitted up a selection of chain hoists (thank you Graham for loaning yours) and supported the boat in slings. 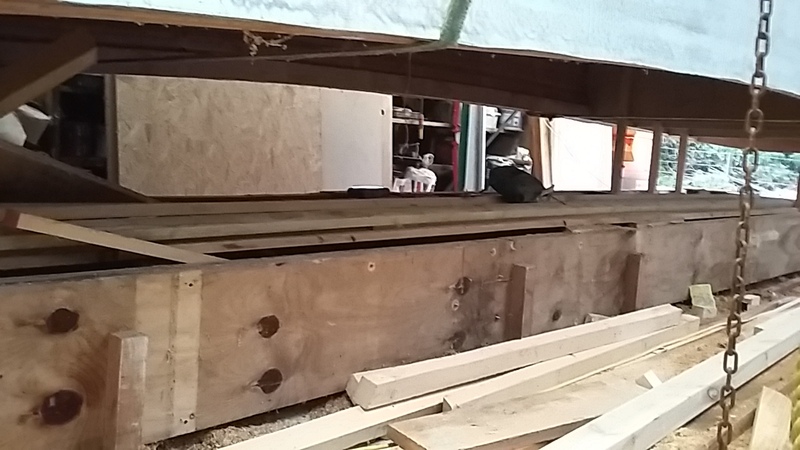 We then got inside and removed a remarkable quantity of ironmongery and stripped out all the molds…. Thank you Nigel for doing the majority of this work! Then with the boat hanging free in it’s slings we set about persuading it to rotate in the slings – this proved more effort than expected (mostly because, as one of the parties explained “this IS a F*&^&ing big boat Malcolm”) – but with the assistance of one of the hoists, attached to the inwhale and then keel, dragged it upright! 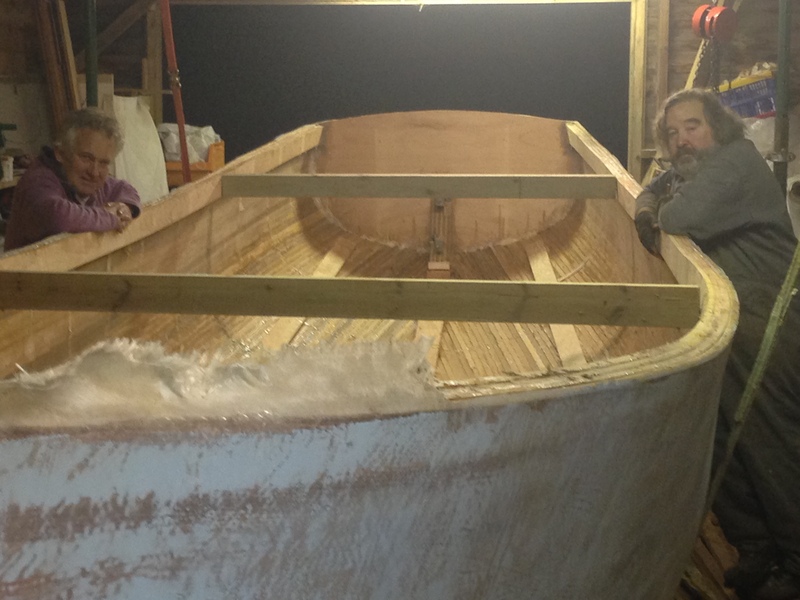 Half way round – it’s BIG inside! The team – goal achieved! Smiles all round (at last!) – it IS straight, even though it does not look it in this photo! 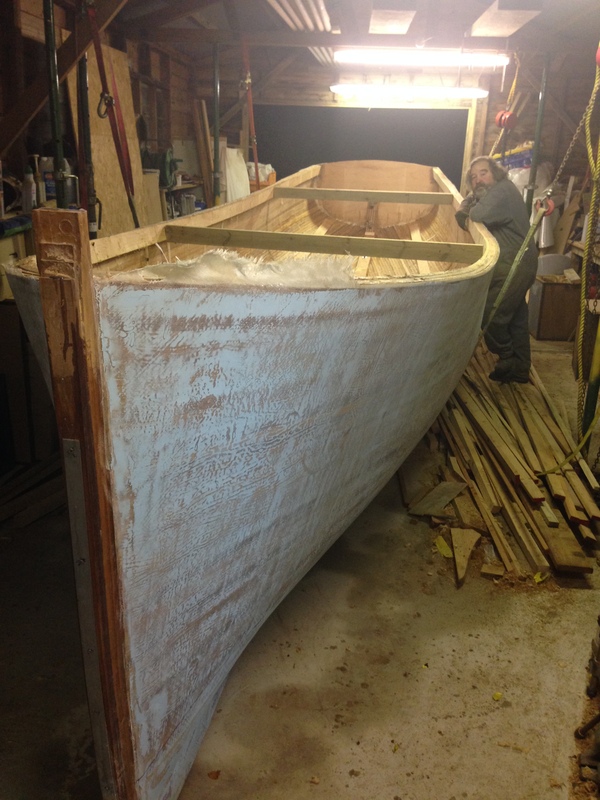 Now we need to clean off the glue inside, add epoxy fillets to stringers and hog, bevel the tops of the stringer and hog and then clad with Epoxy cloth as on the outside… then it’s “just” fitting out, engine beds, decks, coach house, machinery, mast, rig and …gin on the lake!!! 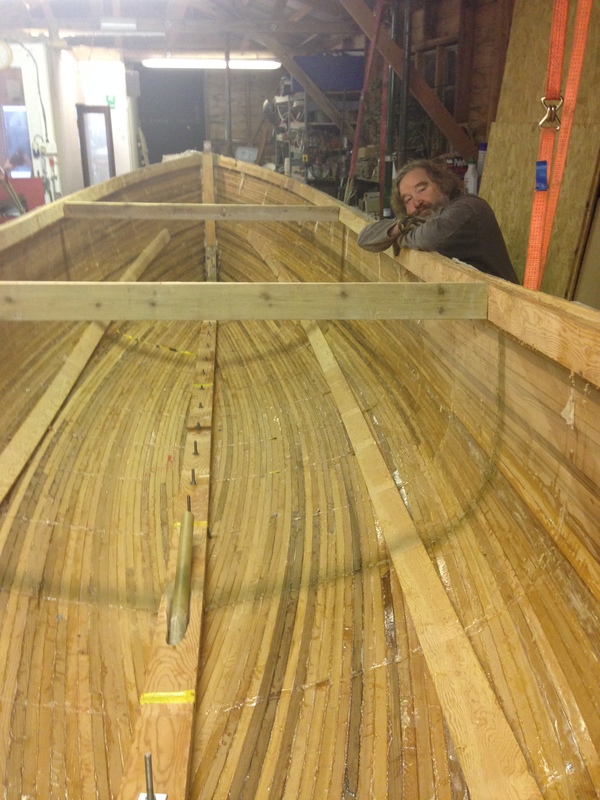 This entry was posted in Hull Build and tagged hull build, Steam Boat Association on October 30, 2015 by sybefur. Fibreglass the inside too? You mean all that beautiful wood and construction is completely hidden by glass?